UCLA professor Yang Yang, member of the California NanoSystems Institute, is a world-renowned innovator of solar cell technology whose team in recent years has developed next-generation solar cells constructed of perovskite, which has remarkable efficiency converting sunlight to electricity. Despite this success, the delicate nature of perovskite—a very light, flexible, organic-inorganic hybrid material—stalled further development toward its commercialized use. When exposed to air, perovskite cells broke down and disintegrated within a few hours to few days. The cells deteriorated even faster when also exposed to moisture, mainly due to the hydroscopic nature of the perovskite. Now Yang's team has conquered the primary difficulty of perovskite by protecting it between two layers of metal oxide. This is a significant advance toward stabilizing perovskite solar cells. Their new cell construction extends the cell's effective life in air by more than 10 times, with only a marginal loss of efficiency converting sunlight to electricity. The study was published online Oct. 12 in the journal Nature Nanotechnology. Postdoctoral scholar Jingbi You and graduate student Lei Meng from the Yang Lab were the lead authors on the paper. "There has been much optimism about perovskite solar cell technology," Meng said. In less than two years, the Yang team has advanced perovskite solar cell efficiency from less than 1 percent to close to 20 percent. "But its short lifespan was a limiting factor we have been trying to improve on since developing perovskite cells with high efficiency." Yang, who holds the Carol and Lawrence E. Tannas, Jr., Endowed Chair in Engineering at UCLA, said there are several factors that lead to quick deterioration in normally layered perovskite solar cells. The most significant, Yang said, was that the widely used top organic buffer layer has poor stability and can't effectively protect the perovskite layer from moisture in the air, speeding cell degradation. The buffer layers are important to cell construction because electricity generated by the cell is extracted through them. Meng said that in this study the team replaced those organic layers with metal oxide layers that sandwich the perovskite layer, protecting it from moisture. The difference was dramatic. The metal oxide cells lasted 60 days in open-air storage at room temperature, retaining 90 percent of their original solar conversion efficiency. "With this technique perfected we have significantly enhanced the stability." The next step for the Yang team is to make the metal oxide layers more condensed for better efficiency and seal the solar cell for even longer life with no loss of efficiency. Yang expects that this process can be scaled up to large production now that the main perovskite problem has been solved. It's sort of scary how fast the perovskite cells are progressing. If they can be made stable at current efficiency levels (or at even slightly better levels) these could be come the "everyman's solar cell" - affordable even in the poorest countries. Of course, the perovskite cells generate money - but for researchers only. You are aware that researchers get paid a fixed salary? And that none of the money they generate (via more grants or whatnot) ends up in their pockets? If people were to follow your mode of thinking (thankfully no one does) then we would never even start researching anything. So just STFU and enjoy that people are smart and continue to work so that ungrateful wretches like you can enjoy all the things you currently use. And in all the years you have done so you haven't had a single taker. So either you are the smartest human alive (unlikely, since you haven't managed to show any work on...anything...ever) Or you're just the only one who hasn't gotten the memo. Guess which. I give recognition to scientists because I know how science works: by small increments (like in this article). It's not the Hollywood fantasy you think it is. It's hard work and slogging away at details. Until you actually get up the guts to talk to a scientist you'll never figure this out. Being ignored with mainstream, which believes, it's fairy tale according to pluralistic ignorance paradigm. so... you allow your religious acolytes to feed your Dunning-Kruger... so what? and i've already proven you a liar on that front... not only did i call you out on your sock army, but DOCILE is one of the ones i reported as being in said army, along with three other names you've used in the past year... how is that not using a sock army to downrate, and how do you think it proves you didn't do it? how could you do that if you didn't create them and manage the accounts? Did you ever notify it? you even bragged about it later. so now you claim this is not you? or that others are projecting? how does your posting from a sock army that was used to downvote/TROLL demonstrate projection or that you didn't create the sock army? This might be a silly question but I have to ask. Why don't they just incase the things in clear acrylic plastic as soon as they are made? That stuff will stay clear for years. Windows are made from it. That seems like it would solve the air and water problems. 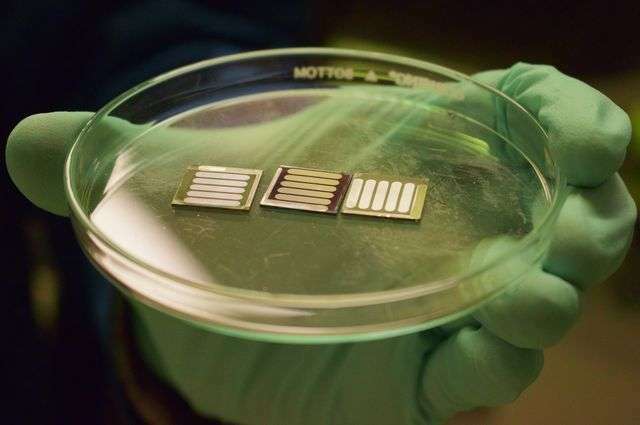 One of the advantages of perovskite cells is that they are very thin - which means they can be printed on any kind of surface - even flexible ones. Oops Zeph...sockpuppet-voting...again? Getting tired of your current account? Need to get banned yet again? You are, without a doubt, one of the most pathetic individuals on this planet. Back on ignore you go. Ok, I can understand that. There are UV blocking dyes out there too though that could be put into the plastic. @AP, but so can plastic. That's why I don't understand the problem.